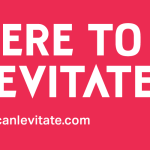 Levitate – Are you ready to Levitate? Are you ready to Levitate? Hands up who is excited?! If you haven’t already registered for Levitate Summit please do so now – time is ticking and our free tickets are going fast! See you at The Custard Factory Thursday 26th! It’s Time To Levitate Birmingham!